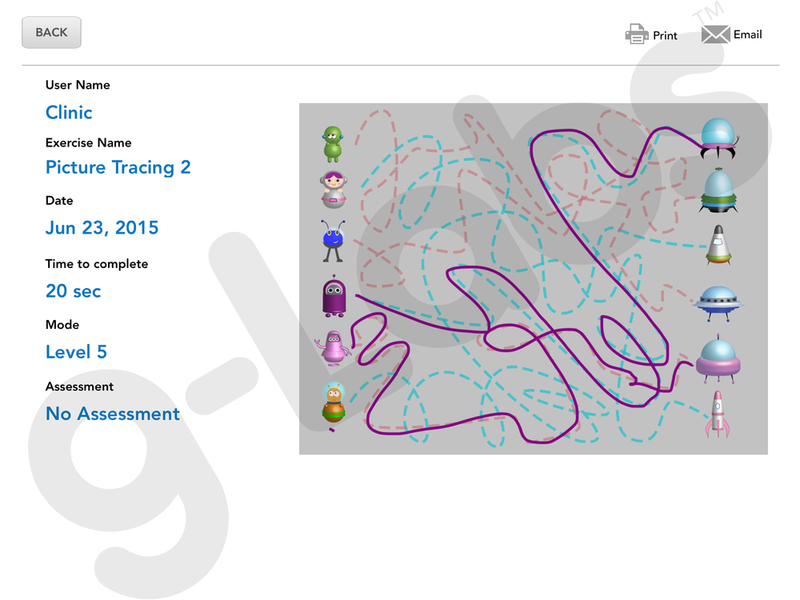 Description of the "Picture Tracing 2" exercise in the Opto vision training app for iPad. Help the aliens find their space ships! This exercise uses fun alien characters and cute matching space ships. Lines connecting the aliens to their ships, some red and some cyan, can be traced using a stylus or with your finger on the iPad screen. This exercise has 5 levels of progressively increasing difficulty. For less of a challenge, try Picture Tracing 1. How to Purchase: Available as an in-app purchase in Opto, the vision training app for iPad. Download Opto and find Picture Tracing 2 in the in-app library of exercises. Available as an individual exercise ($4.99 USD) or at a discounted rate in Expansion Bundle 1 ($79.99 USD). Tracing exercises always record a screenshot of the patient's drawing. Results are saved in the reports section of Opto when the "End" button is tapped to close the exercise. Like all activities in Opto, the date and duration of the exercise is also logged. A patient assessment will be recorded if the user is signed into his/her personal profile. Download Opto for iPad to access the "Picture Tracing 2" exercise.